Two years ago Chloe Townsend was dumped at the altar and had to leave behind everything that mattered to her. Even now she’s finding it hard to move forward. That is until she lands an incredible job, running a brand new boutique hotel. Suddenly she’s starting to put her life back together, and, apart from the fact that her hard-to-please new boss is breathing down her neck, things are looking good. But what goes on in the Hope Street Hotel is a far cry from anything she’s ever dealt with before. This is a pioneering ‘divorce hotel’ designed to make every aspect of breaking up efficient and pain-free. In one single weekend, Chloe’s team promises to take care of everything – legal, technical, emotional – and guests check out carefree and single. 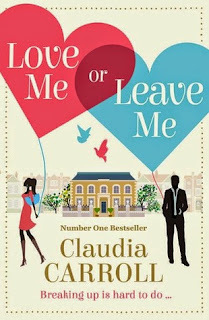 No one is better qualified than Chloe to understand what couples need when their relationship is at breaking point, but she soon finds herself having to tackle the heartbreak she’s tried to bury. In particular three couples need her help – Jo and Dave, Lucy and Andrew, and Kirk and Dawn – and the opening weekend is full of revelation, trouble, memories happy and sad, facts that need facing, and some very big surprises. Love me or leave me left me with mixed feelings. On the one hand I was intrigued by the concept of the hotel for facilitating easier divorces (what an odd business premise) and I quite liked Chloe’s evolvement as hotel manager. Once you meet all the couples at the hotel though, and their stories unfold, they are really quite intriguing. The well-established story lines are melded into a novel that kept me interested. I wasn’t even sure until the end if any of them would manage to save their marriages- I wanted them all (ok not all!) to rediscover each other or at least come to appreciate the other’s point of view. It was really carefully put together in that respect- enough detail to keep you reading while still exploring the other marriages. I really believe that I would give this novel a 5 star if I hadn’t found the beginning so muddling. It stuck with me unfortunately. Regardless, I think a lot can be appreciated with Carroll’s writing and there were so many interesting concepts and original characters together that Love Me or Leave Me was well worth the read. Thank you to Harper Collins UK for our review copy. All opinions are our own.